I’m sure you’ve all seen the infamous, colorful chairs that consume the patio space at the Union Terrace. These chairs have become an iconic symbol for lifestyle and activities of downtown Madison–for good reason, too! 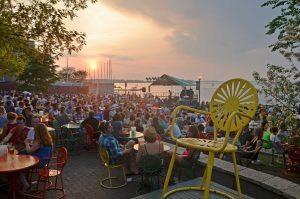 The Memorial Union Terrace is one of the most anticipated event centers of the summer. It is the perfect place to get together with friends and family on a calm, warm summertime night. The Terrace offers live entertainment of all categories, cold drinks, and a classic menu of brats, hamburgers, hot dogs, ice cream, and more! The live entertainment is certainly what brings such large crowds down to the Terrace on weekends. The entertainment varies from smooth jazz to open mic nights, but there is also something for everyone to love! Live music is the perfect touch to a summer night on the lakefront. Memorial Union Terrace also boasts a great selection of summertime food and treats! You can enjoy a grilled brat or hot dog from “The Brat Stand”, and end the night with a cold scoop of your favorite flavor of ice cream from the “Daily Scoop”. In addition to the great food and live entertainment, you’ll probably want a few cold drinks! There are plenty of beer kiosks where you can purchase pitchers of your favorite beer–local or nationwide. Besides, nothing goes better with brats and hot dogs than cold beer. You can find more information such as hours, entertainment options, and special events on their website.